Matthew Sinclair has picked up, via The Jewish Chronicle, the text of a letter sent to London School of Economics Freshers. As Matthew points out, the tone of the letter—signed by Students' Union General Secretary, Fadhil Bakeer Markar, and Mature & Part Time Students Officer, Ziyaad Lunat—is inflammatory and partisan. 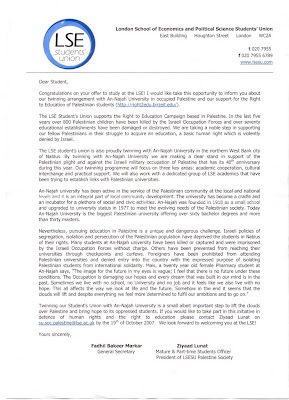 From the statement that "800 Palestinian children have been killed by the Israeli Occupation Force" to "our fellow Palestinians", to the idea that Israel denies the right to education and "Israeli policies of segregation, isolation and persecution of the Palestinian population" the letter would be more at home in some Islamist newsletter than being sent to every LSE fresher. This is particularly shocking as the letterhead suggests it has been paid for with students' union resources which means that it has been funded largely through the university's block grant and, therefore, partly by the taxpayer. Matthew also points out that there are Israeli students at the LSE: this is hardly designed to make them feel included is it? The deceptive title of General Secretary doesn’t involve taking minutes, but responsible for overall leadership and co-ordination of the Union activities, campaigns and committees. The General Secretary chairs the SU Executive and is also the primary representative of LSE Students to the School and external bodies such as NUS, ULU and the Media. Fadhil’s priorities for the year includes, building a better relationship between the School and SU, to lobby for a 24 hour common room, make the Union more inclusive, to lobby for better student support and to improve every student’s experience of LSE. Well, I think that—with enough support in the blogosphere—we can help Fadhil with his wish to make the SU more inclusive, and simiultaneously allow him to represent the SU to the media: a double whammy of delight, if you will. Alternatively, why not take Fadhil up on this offer...? And why not also contact Ziyaad Lunat, Mature and Part-Time Officer? My responsibilities include ensuring the welfare and representation of mature and part-time students, liaison with the Education and Welfare sabbatical on Academic and Welfare Issues affecting mature and Part-Time Students' Forum and holding regular surgeries to deal with enquiries from mature and part-time students. 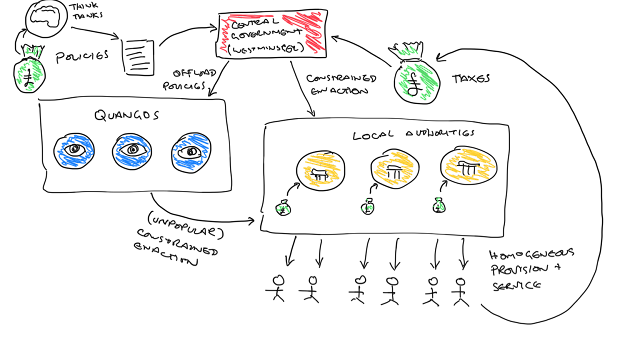 There are a number of topics that you might raise. For instance, whilst they are supporting their "fellow Palestinians", perhaps Fadhil and Ziyaad could ask them to pressure their "fellow Palestinians" to stop the constant rocket attacks from the Gaza Strip? At the same time, perhaps their "fellow Palestinians" might also appeal to the Arab countries to honour their 1947 pledge to guarantee Israel's borders (rather than, for instance, attempting to invade)? Or maybe Fadhil and Ziyaat might care to comment on the suicide bombers who, thanks to the infamous Wall, seem to be having rather less success in blowing up Israeli clubs and pizza parlours than they did a few years ago? No doubt Fadhil and Ziyaat will be more than happy to answer your questions, especially if you happen to be an LSE student. I mean, we all know that students are some of the most fatuous people on the planet and so we do not expect much, but maybe the LSE student body would like also like to ask some questions of their representatives? Oh, and your humble Devil would love to hear from any LSE students who voted for these two bigoted goons: may one ask what your motivations were? Or has the LSE always been a hotbed of anti-Israeli bigotry? At my university - Birmingham - something similar has manifested itself. The New Black and Minority Ethnic officer, Yasmin Patel, has promised as part of her manifesto to campaign against 'illegal wars, occupations and invasions'. Quite why she believes this has anything to do with making BME students feel more included on campus, and raising awareness of issues that affect them as students, I have not the faintest idea. She also wants to oppose Islamaphobia. I fear she may have connected the two with bugger all foundation. So it certainly isn't just the LSE that has been invaded by the politically correct, anti-war contingent. These appologists always seem to forget about the negative aspects of Palestinian 'society' dont they? So heres a little of what they DONT tell us! I work for a charity(shock horror, a jew loving right winger helping others?) and we helped a Palestinian Iraqi family who had been given a few hours by the 'Mahdi Army' to leave Iraq on pain of death, they tried all the Islamic countries and NONE wanted to know! So a Christian country took them in! These poor fuckers were ignored by Hamas and Fatah because they had no money and no connections so they came to us with nothing! Anyway we sorted them out with all the things needed to start again, bedding,kitchenware,school clothes/kit for the children. My point in telling this is that the only people who would help these people were Christians! I asked the man why they could not get into a Muslim nation and he said " I had no connections or money to bribe the officials from other Muslim nations! Only Christian nations give help without the need for "baksheesh"(bribes)"! Makes you think doesnt it? The terrorists give toy guns to children and tell them to rush toward IDF soldiers in the hope that the israelis will shoot them by mistake! They also use children to surround terrorists so the IDF cannot target them without killing the children! Israel is a small free democracy trying survive in a very cruel and hostile enviroment and perhaps thats why the leftists here hate them so much and isnt it funny how the sudanese refugees(muslims)risk so much to get into Israel and not another muslim nation? One more thing, can you guess where the Palestinian family want to settle down? have a guess! and it aint a muslim nation thats for sure! I have nothing particularly clever to say except to say Well Said. The LSE has nothing on SOAS, also known as the School of Anti Semites. A friend's cousin studied there, and being Jewish suffered a great deal of 'anti-zionist' abuse. Upon complaining to someone - also Jewish - at the University of London was told he had to expect it, put up with it etc etc. This was at least 10 years ago.